Joesonghamnida. I realize it’s been a year since this drama has aired and I still have 9 more episodes to go. But I will get this done. I will!!! Along with the other dramas in the hopper. That is, if anybody is still interested in them since it’s been a year already. Once I am fully caught up, I plan on taking on less dramas and going through them diligently. And now, on to the recap (as you can see that I am doing this, this means that I have dug out my external hard drive that this is located on). Too much drama, not enough hours in the day. We start off this episode with our mama fox laying stunned under water. She calls out her daughter’s name in her head and it seems that little Yeon can hear this. The girl begins freaking out while we see Cho Ok’s illness is worstening and Man Shin is busy constructing what looks like a cross out of wood while Lady Yang sits all proper and creepy, waiting. We learn that she switched out the burial clothes that Yeon made with others, so that the robes Yoon burned would not destroy Cho Ok’s chance at living. Man Shin comes out, changed and proper looking now, and asks if she slept well with a smirk since it will be a long day. Lady Yang, ignoring the jibe, asks if the preparations are done. Man Shin replies that they are and asks Lady Yang to bring Yeon quickly. This takes her back as she though the ceremony couldn’t go on until nightfall. Man Shin replies with what reasons do they have to keep Yeon at home until then. Good Question. He then puts down a ceramic bottle. What be that? Meanwhile, Yoon has made it to the temple in search of the lingzhi mushroom. The monk says that it comes from divination and Yoon asks what that means. The monk says that they have heard that such a mushroom exists elsewhere and then does a Buddhist chant and walks away, leaving Yoon mystified. Yeon runs home, wiping her tears and passes by Jung Kyu’s servant. He notices her and goes to Jung Kyu asking why he didn’t say that he came out to meet Yeon. Jung Kyu jumps to his feet and asks if his servant if he really saw Yeon Yi. This surprises his man who says that he just saw Yeon running in that direction, didn’t Jung Kyu know? Jung Kyu, of course, runs off in search of her. As he runs by the tree, he catches a glimpse of the keychain and backpedals. He grabs it off the branch and runs after the girl, calling her name. When he arrives at the Yoon house, Choong Il doesn’t want to let him in as he has warned Jung Kyu away from Yeon before. Jung Kyu replies back with that he has already told Choong Il that is none of his concern. At that moment, Lady Yang returns and asks what is going on. Choong Il, feeling victory near, replies that Jung Kyu wishes to see Yeon and is being stubborn about it. Yang says Choong Il back to his room (upsetting him). He reluctantly goes and Yang turns to Jung Kyu and scolds him for unseemly behavior of a noble son. Jung Kyu apologizes, but says he must see Yeon Yi before she leaves. This shocks Yang who did not know that Yeon and her mother was planning on leaving. She then demands that Jung Kyu return home and she will tell Yeon he stopped by. Jung Kyu reluctantly goes while Yang stares daggers in his back. Lady Yang then rushes into the house an goes to Yeon and her mother’s room where she sees the two packs ready to go and the two women no where in sight. Yang then goes rushing about looking for Yeon. Her daughter is doomed to die if she can’t find Yeon. Meanwhile, the depressed Jung Kyu reluctantly leaves. He turns and looks back at the Yoon house multiple times. We then cut to see the sad Yeon on her way back as well. It just so happens that the two have passed each other in town, however, they are on divergent paths and do not see this. Yeon finally arrives back at the Yoon house where Yang is frantically and desperately searching. When she walks in, Yang suprises her by running up and hugging her. Yang says that Cho Ok was looking for Yeon and then drags her off. Lady Yang hurriedly drugs soup while Yeon sits with Cho Ok and her maid. The sick girl turns to Yeon and says that the persimmon tree is dying. She tells Yeon to take and eat a persimmon and then hide the rest. This surprises Yeon and Cho Ok elaborates that if Yeon doesn’t, Choong Yi will eat them all. Her maid says that she will watch over the persimmons and then Yang calls for Yeon who leaves. Yang tells her to sit down and then Yang gives her a type of Korean punch for being such a good caretaker of Cho Ok. Yeon, nervously and reluctantly takes the drink while Yang watches on closely. After hesitating, Yeon goes to drink it, but crinkles up her nose and puts it down. Yang wonders what is wrong and Yeon says that there is a strange smell. Yang, feigning innocence, smells it and says Yeon is acting spoilt as there is no funny smell. Yang then gives it back to her, telling her to drink it all up. Poor Yeon. But just from Yang’s actions and desperation, you know that there is something wrong. Yeon finally goes to reluctantly drink. Meanwhile, San Daek is still lying helpless in the lake. She gets a bad feeling and struggles to move while calling for her daughter. Yeon, seeming to hear this, immediately drops the drink, spilling it. She apologizes to Yang and then runs out where she sees our totally loveable Chun Woo. She enlists his aid in finding her mother who went to the mountains to “pray” (really fighting the exorcist) and has not yet returned. She says she keeps getting strange thoughts and then runs off. Chun Woo drops his fire wood and takes off running while Kye Hang watches on. Chun Woo runs into his father, Steward Oh, who asks if his son’s running has anything to do with San Daek again. Chun Woo ignores his father and goes to walk away. Oh calls out and says that is not there place and when it looks like his son still won’t listen, Oh say that due to Chun Woo’s unforgivable crime, Oh has already lost a wife and daughter, thus he begs Chun Woo to listen and stay. What crime? Chun Woo does not heed this and runs off, angering Oh. Kye Sang whispers something to Yang who tells her to notify the necessary people. Kye Sang (or is it Yang’s trusted maid?) goes off, but not before noticing Yeon returning. Yeon quickly goes into the room and begins cleaning up the mess. Yang tells her that is okay – she doesn’t have to do it. Yeon can clean it later as Yeon needs to go into the mountains with Yang. This surprises Yeon. Yang says that she has received a message from San Daek, asking her to bring Yeon to the mountains. Yeon’s ears prick up at this and Lady Yang says that San Daek went there to pray, didn’t she? Yeon then asks who sent the message. Yang is not happy being questioned, Yeon replies that she doesn’t mean disrespect, but her mother’s orders were to stay put. Yang then asks if Yeon believes she is lying. Yeon says it’s not that either. Yang sits down and says she has heard that San Daek and Yeon were leaving. This shocks Yeon. Yang tells her not to worry as she won’t stop the two girls. A lot of things have happened (good and bad) and Yang thinks it best to leave before Yoon gets back thus the two (plus 2 maids) leave while Kye Hyang and her sons see them off. Choong Il asks where Yeon is going and Kye Hyang awkwardly says to see San Daek. Choong Il asks if that is the case, then why is Yang is going, too? This makes Kye Hyang even more nervous. She says that it must be that Lady Yang has business to attend to. Choong Yi pipes up and says that is obviously not he case, surprising his mother. She asks what he means. Choong Yi looks after them and says that “they are bad people.” Kye Hyang tells him not to say anything to anyone, worried that he knows something more, but that turns out not to be the case. Choong Yi thinks that the two left to go out to eat by themselves. He calls them bad people once more and spits after them. Kye Hyang is relieved that Choong Yi doesn’t know anything and tells her sons to follow her back inside. Choong Yi does, but Choong Il casts a worried glance back at the direction the four girls headed in. Looks like he’s got a bad feeling. He’s smart and not so bad when he isn’t being an arrogant arse. Yeon and Yang are walking in the woods and Yeon points out that they are going in the opposite direction of the mountains. Yeon then asks to be able to rest and relieve herself. Yang turns around and says their destination is only a little bit further and turns and marches on. Yeon looks behind her, but the maids block her way of retreat. Meanwhile, Chun Woo searches frantically for the missing San Daek. He is near where she is, but doesn’t think to look into the water where San Daek is struggling to overcome her torpor and crawl out of the lake to save her daughter. Yoon is at the port only to learn that there are no boats even after the man said there were numerous ones. Yoon grabs the man and asks if Yang ordered him to do this wild goose chase? The man boys and says that he has done a crime worthy of death. Yoon tells him that his life will do nothing for him and orders him to find a way to cross or Yoon will swim the distance. At this time, Oh arrives in a boat. Once on the boat back to his house, Yoon asks after Yeon. Oh says that Yeon was still there when he left. The worried Yoon urges the boatman to hurry as fast as possible as Yoon will pay him well. Will Yoon get there in time? He worries over both Cho Ok and Yeon. Meanwhile, when Yeon keeps complaining about being tired, Yang snaps and has her maids drag Yeon along. San Daek during this time struggles and struggles. She manages to kick herself off the bottom of the lake and begins to move upward at the exact moment that Yeon and Yang pass by. Yeon collapses and Yang demands she gets up. Yeon notices the birds gathering again and tries to stall. Yang refuses to listen and the maids pick up Yeon and start dragging her. Yeon tells her that if they don’t go back, something bad will happen. Yang refuses to listen and walks right into the flock of birds. The birds start attacking and Yeon goes a little gumiho, but instead of stopping the birds, she turns and runs away, dropping the bell her mother gave her. Yang and her maids finally get up after the attack and Yang is worried to see Yeon gone. She tells her maids to quickly look for the child as she couldn’t have gotten far. Not far? Yeon has made it all the way to Jo Kyun Kam’s place. Isn’t that a bit of distance from where they are? Jo asks if Yang dragged Yeon out and Yeon replies that she didn’t. She names Sam Wol and Yu Wol (the maids). Jo doesn’t believe this and asks who the third person was. Yeon clams up and Jo comes over to her and tells her to sit down. Jo asks if Yeon saw Yoon at all. Yeon immediately replies that she hadn’t and Jo tells her to think back carefully. Yeon reiterates that Yoon wasn’t there as he went to the temple for medicine. This disappoints Jo who asks if Yoon really did nothing. He gets up and tells Yeon to go home. Looks like he only wants to help Yeon if it means crucifying Yoon personally and not his wife. Poor Yeon is shocked. She asks to remain there until San Daek returns, but Jo replies that she can’t since no one reported Yeon as being kidnapped. Yeon says that Yang was obviously kidnapping her, but Jo won’t listen. Poor Yeon. At the Yoon house, Cho Ok’s doors slide open and the girl creepily pops awake. As if in a trance, she gets up and begins walking. What now? At this time, Yoon rushes home. He sees a straw dummy hanging in San Daek and Yeon’s room. He cuts it down and angrily throws it outside when his wife runs up. He demands to know where Yeon is. Yang replies that she doesn’t know, which is the truth. Yoon demands the truth once more as he doesn’t know what he will do if she keeps it up. Yang steps forward and demands he just stab her then. Omo. Crazy woman. Yoon tells her that it is bad enough she deceived him, but now she wants to stain his hands with blood? Yang’s classic reply? She wouldn’t have deceived him if she actually feared death. Yoon gets angrier and pulls out his sword saying he cannot forgive her. Yang lifts her head, closes her eyes, and stands her ground. Yoon gives a mighty swing, but does not kill her. His sword hits the ground and he demands his wife leave as he cannot live with such a woman anymore. He goes to walk away and Yang asks about his own betrayal of Cho Ok? In order to save Yeon Yi, he is telling Yang to watch her precious daughter die. Yoon angrily turns around and yells that he is trying to save both lives – why can’t Yang see that? Yang reminds him that Yeon needs to die to save Cho Ok. If Yoon was going to let his conscience get the better of him, then why did he invite San Daek and Yeon to live with them in the first place? Yang says that she will leave if he is kicking her out, but only after she saves Cho Ok’s life. At this time, the maid runs up and announces that Cho Ok has disappeared. Yoon runs off in search of his missing daughter who is blindly walking straight into a lake. Yoon sees this and runs after her, yelling her name. He grabs her, but Cho Ok keeps walking forward, not listening. Yoon asks why she is doing this? She needs to wake up and listen to him and go back home. At this point, a voice calls out to let Cho Ok go. The shocked Yoon lets go of his daughter and looks up. He is then knocked out and sinks under the water. Who is that man cloaked in black? Is that Cho Ok’s dead relative? Yoon comes to and sees Cho Ok on the boat with her uncle. He reaches out for his daughter and is once again scolded by his relative’s spirit for interfering with the will of heaven. Her uncle is bound and determined to take her with him. He grabs Cho Ok’s arm to pull her along, but Yoon refuses to let go and tries to get Cho Ok to wake up and listen to him. Cho Ok asks why he is doing that since he already threw her away. She lets go of his hand and he asks her when he did such a thing. Cho Ok says when he burned the burial shroud. Yang comes up and says that Cho Ok is right and everything is Yoon’s fault. His brother says he has not changed and goes to take Cho Ok. Yoon begs Cho Ok’s uncle to take him instead, but Yang interferes and asks to be taken as she is more worthy than Yoon. Cho Ok’s uncle refuses as it is not their time at all. He goes to leave with Cho Ok, but Yoon once more grabs her hand and demands to know if Yeon can replace Cho Ok. At this, the boat vanishes leaving Cho Ok with them. Yoon piggybacks her home while Yang says she will look for Yeon. Yoon, lifelessly tells Yang to do whatever she wants and continues on. He apologizes to his daughter (in his head) while she smiles and hugs his neck. Is Yoon going back on his word of trading lives or is he just sorry for making Cho Ok feel that she was cast away? Our Poor little Yeon Yi is sitting and crying by the waterside. She notices that she has once again lost the bells. Is that why her mother isn’t coming? Meanwhile, San Daek is desperately struggling to the surface of the lake. She is so close, yet she cannot remain afloat as the wound in her arm drags her back down. Yeon sneeks back to the Yoon house and carefully looks around to make sure there is no one there. She falls climbing over the wall only to be met by Choong Il wondering why she is there. Yeon begs him to lower his voice as Yeon will be in big trouble with Yang if she is discovered. Choong Il asks what the matter is. Loving him more and more. He’s a good young actor. Hope to see more of him in the future. Yoon arrives home and takes Cho Ok to her room. He lays her down and she goes back to sleep. She looks bad, but not nearly as bad as earlier. What will Yoon do? Choong Pil keeps a lookout and approaches Yoon. Choong Il says he needs to talk to Yoon and asks him to keep it a secret from Yang. Oh. Drat. I have a bad feeling about this. Yoon goes into a room where Yeon pops her head out. Yoon tells her not to worry and come out. He opens the cupboard and the worried little girl reluctantly comes out and wraps him in a hug. He asks what is wrong and Yeon asks for his help. Yoon repeats his question and Yeon tells him what Yang did. Yoon tries to comfort Yeon who apologizes saying that he will have to go out to find Yang as she is hurt because of him. Yoon kneels down and says it will be okay. Yang is just out of her mind with worry for Cho Ok. Yoon apologizes for his wife and hugs Yeon who then asks his help in finding her missing mother. Yoon tells her once more not to worry as he will send people out. Yeon is relieved to hear this and asks if this means that he is saving her. You can tell he is feeling guilty. He goes to leave and Yeon pulls out a picture that she had drawn of him. Yeon is touched by this. He thanks her and says he will treasure the drawing. He tells Yeon to rest and leaves. Yoon goes to his room where he takes out Yeon’s drawing once more. Is his resolve wavering? He crumples the drawing and shoves it angrily in a drawer. He goes outside where Oh timidly hands him food. Yoon takes it and goes into Yeon’s hiding room. He then sits down and tries to give Yeon food. Yeon looks at it and does not immediately take it. Yoon tells her that it is okay and Yeon reluctantly takes it. Before she bites into it, she smells it. I think she can smell the sedative. She carefully sniffs the cookie. Yoon then recalls the first time Yeon arrived at the house and was so frightened at the cookie as well. Yoon tells her to eat it and think of her father. Yeon thins to herself that even Yoon is trying to get rid of her. Yeon tells him that she is thirsty and will eat after getting water. She runs out, but is confronted by Oh and another servant. Yeon turns around to see Yoon and the other man grabs and Yeon and knocks her out. She is then slung over the man’s shoulder and the three set off with a worried Choong Il watching on. Jo’s servant runs up and tells him about Yoon. This makes Jo happy. He finally has a hold on destroying Yoon. Meanwhile, Yang is busy searching for Yeon with her maids. They find Yeon’s bell just as Cho Ok’s nurse runs about and tells them that Yoon has found and captured Yeon so Yang can return home. This relieves the worried mother. She tells the maid to throw the bell away and the maid tosses it into the water where the horrified San Daek catches it and struggles to the surface once more. Woo Chun sees a ribbon of San Daeks and is there when she drags herself out of the water. San Daek clutches the bell and worries after her daughter. She quickly leaps across the water and Woo Chun watches, shocked at seeing his love’s gumiho state. Jo arrives at Yoon’s to see the servants packing carts. He asks what the things are and then tells his men to look threw them. He is searching for Yeon to be hidden? Instead, he finds a straw doll. Disappointed at first, he is surprised when he sees a foot poking out from under it. Yoon comes out and asks why Jo is there. Jo replies that he is looking for Yeon and Yoon asks why. Jo doesn’t say and just asks if Yeon is home. Yoon says he has no time and Jo says he has heard a rumor. He lies and says the rumor is about his son and Yeon meeting at night. As Jo goes to leave, he asks where Yoon is going and Yoon replies to see about an exorcism for his daughter. Jo apologizes saying he didn’t know it was that bad and leaves, telling his men that Yoon is in a rush because he hid a child with a mere straw doll. What next then? San Daek arrives at the Yoon house to find her room empty. She then looks for Yang with a knife, demanding to know where Yeon is. Yang smiles and says she doesn’t know. The crazed San Daek holds the knife against Yang’s throat and the other woman demands to know if San Daek is aware of just who she is holding a knife against. San Daek ignores this and says she knows Yeon came to the lake. Yeon would not have gone there by herself, so it had to be Yang’s doing. San Daek demands to know where Yeon is. 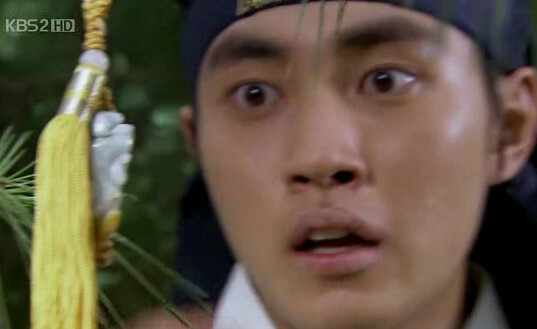 At that moment Kye Hyang comes in, shocked to find San Daek with Yang. San Daek ignores the concubine and says she will slit Yang’s throat if she doesn’t answer. Kye Hyang demands Yang to tell the truth to spare her life, but Yang refuses. Thus Kye Hyang steps forward and says Yeon has gone to the mountains. I am impressed the woman actually lied. San Daek turns her angry gaze on Kye Hyang who iterates it is the truth as Yeon said that San Daek went to the mountains to pray. San Daek doesn’t believe this and goes to kills Yang, but is stopped when Kye Hyang says that Yoon went with Yeon Yi to look for San Daek. The angry gumiho calls Kye Hyang a liar since she knew that Yoon went after the medicine for Cho Ok. Yang replies that he couldn’t get it, throwing everything into chaos. But since Yeon insisted on finding San Daek, he went with Yeon to look for her. Yang says she should be the one angry now, not San Daek. Our fox mama puts down the knife and says that if anything happens to Yeon Yi, Cho Ok will not be spared. Yang replies that if Yeon returns, she will not spare her either. 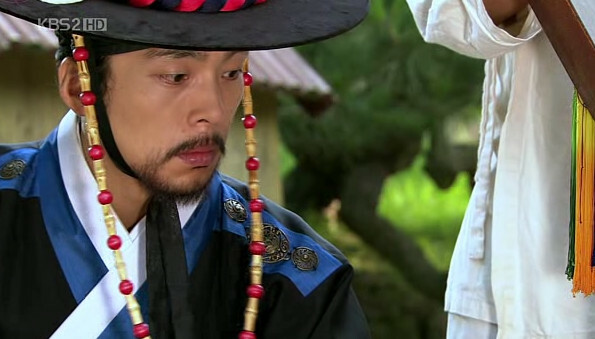 San Daek leaves and the worried Kye Hyang rushes over to Yang to tend to her wound. Chun Woo is back at the Yoon house recalling what he saw by the lake. He shakes his head and just doesn’t want to believe it. At this moment, San Daek rushes by. He gets up and looks after her and goes in the opposite direction. What now? He goes to where Kye Hyang and Yang are talking about their treachery. Yang tells Kye Hyang to be quiet and then asks if the concubine did her job well. Kye Hyang replies that she has men spread everywhere to stop San Daek. Chun Woo overhears this all. Yang spots him and he rushes off to stop San Daek, but she is already on the boat crossing the lake. Since he is mute, he cannot yell out to her so he does his best to catch her attention by throwing rocks at the departed boat. She doesn’t notice. Woo Chun stretches out his hand and beats his chest, struggling to get his words out. He manages to yell that San Daek is going the wrong way. 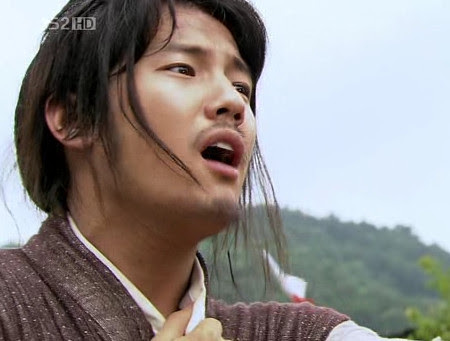 San Daek looks up and Woo Chun calls out that Yeon is in the valley, not the mountains. Who knew he could really speak? Meanwhile, Yoon’s caravan stops. His servant takes Yeon (who is dressed in the funeral clothes she sewed) out of the cart and hands her to Yoon who takes the unconscious girl up to Man Shin’s cave. All of this is being carefully watched by Jo and his men. Will they interfere before Yeon is killed? Yoon enters the cave where Man Shim awaits him dressed in red robes. San Daek and Woo Chun rush to get to the cave in time to stop the sacrifice. Yeon is placed on the cross by Yoon and the episode ends. Cliffhanger. But this drama is horrible like that. It’s also pretty good about dragging things out. This drama could probably actually have been shorter without sacrificing anything.